The Accidental Locavore is a strong proponent of buying as much as you can from farmers’ markets, joining a CSA (Community Sponsored Agriculture) or food co-op. After all, that’s how I became the Accidental Locavore and learned to love the surprise that comes with every delicious box. But what’s in it for you? 1. You get to know where your food comes from. By getting to know farmers and other local purveyors you certainly make a connection to the source of your food, but there are other benefits. When you know your farmer, things can be saved for you, so if you’re not a morning person (like the Locavore) they’ll put stuff aside for you, let you know what’s coming, what’s good that week and what may be at the end of its run. 2. You establish a link that goes far back in time, to our caveman ancestors, that has been eroded by our pre-packaged, fast-food society. Humans have always gathered together for food; it’s a primal need to connect around a meal. Whether it’s groups going out hunting and gathering, or sitting around dinner tables, food has been our major connection with each other. When you connect with farmers you reestablish that bond. 3. Great ingredients allow you to make great food easily. When you start with lovely fresh ingredients you don’t have to do a lot to make them sing. With your connection to farmers comes a wealth of knowledge about how to cook their stuff in new and interesting ways. Even when it’s been weeks of zucchini, farmers will have yet another idea on how to prepare them. That being said, the Accidental Locavore is excited to start another season with Farmer Paul and the amazing weekly farm box. 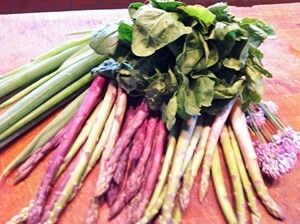 This week was very green, with asparagus both green and purple, a bunch of spinach (that made my husband surprisingly happy), scallions, chives, mesclun and turnip greens. 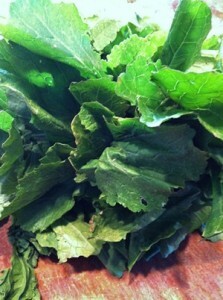 Think the turnip greens will get braised in chicken stock with maybe some bacon or some local andouille tossed in. The asparagus will go on the grill with some curry lamb sausage. Not sure yet about the spinach and scallions. Tune in Friday for recipes, and comment if you have a great idea for the turnip greens. Thanks Grace. We try to eat healthy, but sometimes life gets in the way. Your expo sounds like a good idea, where and when is it? Anne, it sounds like dinner at your house is healthy as well as delicious. I love CSA’s and locally grown vegetables. I am also a big fan of farm fresh eggs, grass fed beef that has not been genetically modified, and locally grown grain. Each year we have an expo where the local farmers can come and introduce themselves and where they are going to sell their goods. I have to agree with you that the farmers have a wealth of information and they are almost always willing to share. I would recommend that everyone check out your local farmers stands or farmers markets. Blogging Boomers Blog Carnival #211 is here!